I am yet to post recipes of my favourite desserts, but then I confess that I enjoy both, cooking and eating savoury dishes more than the sweet ones. It’s because I have had more successful attempts at the former rather than the latter, which follows a very calculative, methodical procedure. And like you would know by now, I like to throw in a bit (of spices) here and a dash (of wine) there. 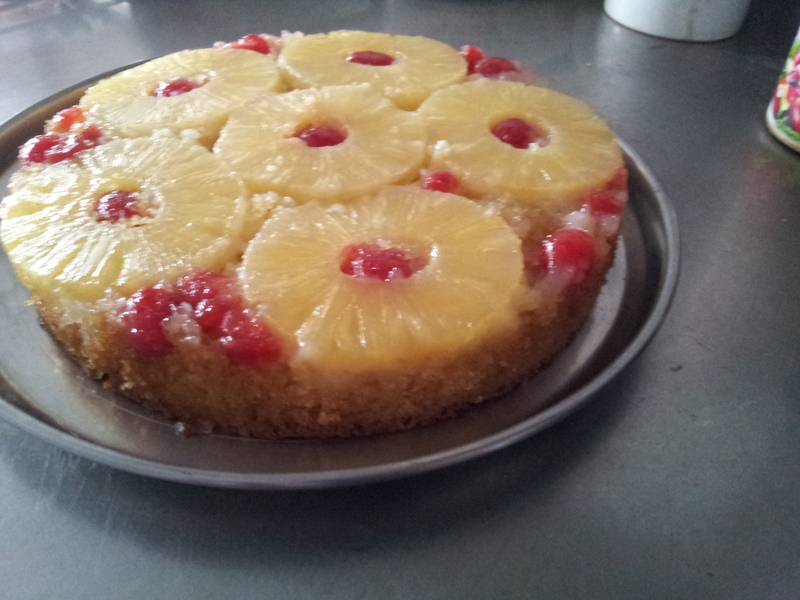 So I did the next best thing- invite a friend and baker to share with us one of her tried and tested recipes- the Pineapple Upside-down Cake! And my, it looks absolutely gorgeous and delicious. Don’t feel like slicing such a beauty, do you? I am here today to make sure you can bake this cake! First things first, know how to measure ingredients while baking. I cannot stress enough on how important it is to stick to the said measurements and be as precise as possible. You can find tumblers for cup/grams/mili litre measurements very easily in any kitchenware store. Get one right away. But before you head out, bookmark this link and go back to it whenever required. You are welcome! Secondly, develop a relationship with your oven. You heard me. Your oven can be like your best girlfriend if you know how to treat it right. But if you try to guess your way around to it, then baking may not be for you. Thirdly, keep all your ingredients handy so you don’t run around the kitchen fetching them. But if you enjoy running while cooking (like I do), then you may choose to skip this step altogether. Now that you are equipped with the three basic steps for baking this wonderful cake, let’s get baking! The recipe will require you to use a 9 inch diameter baking dish. An 8 inch baking dish will also do just fine. Grease the inside of the dish with butter. Now take 2 tablespoons of sugar and generously sprinkle it on to the baking dish. 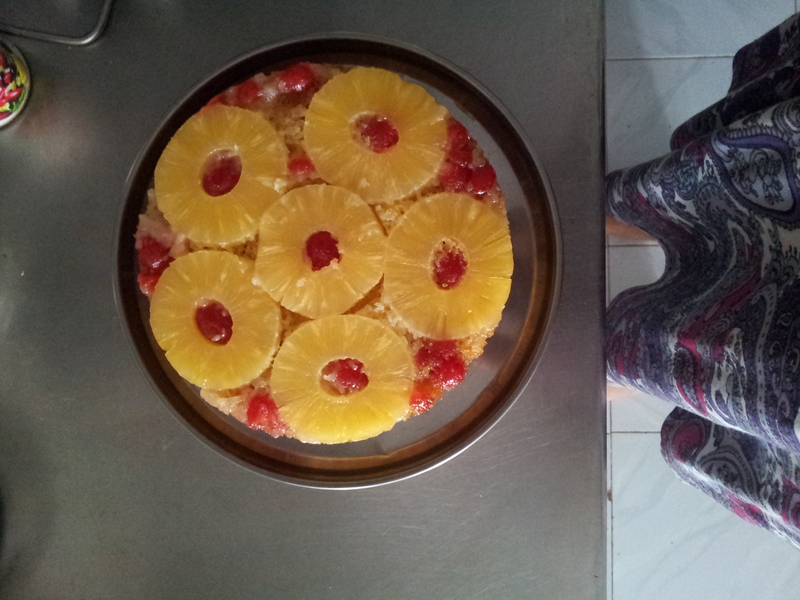 Next, arrange the pineapple slices as shown in the picture. 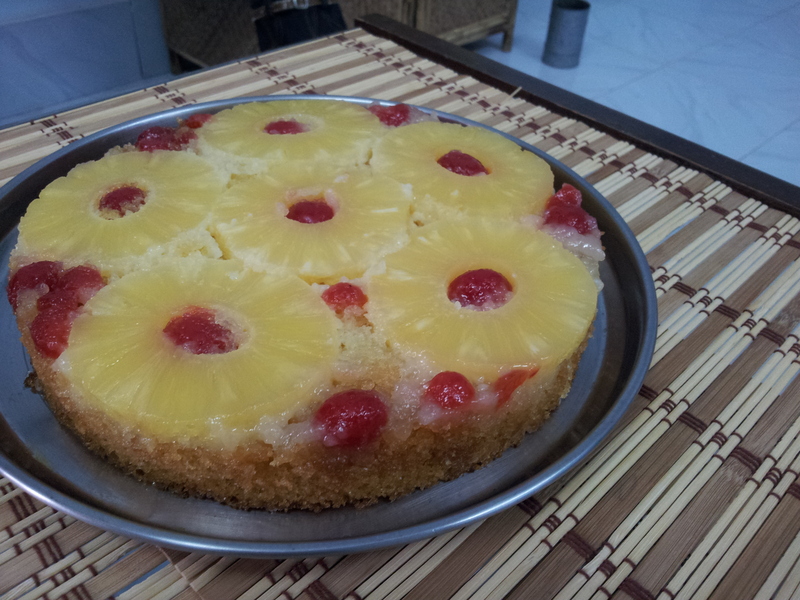 Then place the cherries in the centre of the pineapple rings and fill any empty spaces between two slices. You can now keep the baking dish aside. I hope you have a food processor (which I did not :-/) because that will bring down your prep time by at least 15 minutes. If you have a food processor then put the rest of the ingredients in it and let it do its thing till you see a beautiful line of cake batter dripping out of the spoon you just dipped in it. Be sure of beating the batter till there are no lumps. They wouldn’t cause the sky to fall down but you cake will end up having many not-so-pleasant surprises. You don’t want that. Trust me. If, like me, you do not have a food processor, then beat the butter and the eggs in one bowl (let’s call it bowl no. 1) for about 5-7 minutes. Also, mix maida (All purpose flour) , powdered sugar, baking powder and baking soda in another bowl ready (let’s call it bowl no. 2). Once the egg and butter mix starts to feel fluffy (trust your judgment, you’ll know when it’s time), start folding in the contents of bowl 2 into bowl 1, bit by bit, say about 3 table spoons at a time. And beat it. Just beat it. Beat itttt… sorry. You get the drift, right? 😎 While you are doing this arm exercise (you’ll know what I mean when you get down to it), pre-heat the oven to 200°C. It takes about 10 minutes to pre-heat. After about 20 minutes of Michael Jackson’s ‘Beat It’ you will find yourself with a great smelling, very tempting batter that you may want to lick off of your tiring hands that are about to fall off. But wait, there is more! Don’t forget about the Pineapple juice. That’s the not-so-secret ingredient of this wonderful cake. Add that too and beat itttttttt… for another 5 minutes. Now pour this mixture carefully over the cherry-studded pineapple rings; it will only just cover it, so spread it out gently. To make sure the batter is evenly spread, slowly tap the bottom of your baking dish on the kitchen slab. Trick: hold it from both sides, raise it a little over an inch above your kitchen slab and let it fall on the slab. Do this 4-5 times and you are good to go! Now for the fun part. You will be required to watch your favorite TV show for exactly 30 minutes, without moving from your couch/bed/BFs lap. Why, you ask? Because that is the exact amount of time your oven will take to bake your cake. Isn’t she lovely! So put your cake in for 30 minutes on 200°C and just peace out. Once you hear it go ‘ting’ after 30 minutes, brace yourself. You march yourself to the kitchen, put your oven mits on, strike a pose, click a selfie and take the cake out of the oven. Now go to your selfie; Instagram it, post it on Facebook, share it on WhatsApp. Do this for about 15 minutes and then bring yourself back to your senses because you now need to gently flip the cake on to a plate. Trick: take a plate a little bigger than the size of your baking dish, place it face down on top of your baking dish. Place your right palm on top of the plate and your left hand below the baking dish and flip. Gently place the plate on the kitchen counter, tap the baking dish a couple of times before you carefully remove it from on top of the plate. You will now find yourself in the presence of this magnificently beautiful Pineapple Upside-down Cake, which will force you to click another thousand or so pictures and Instagram and post them all over social media. I understand if you need a tissue because the beauty of this cake will probably make you cry out of happiness. You’re going to feel the pineapple in each bite… divine! Serve this Pineapple Upside down cake while it’s still a little warm, with a pot of some strong coffee. Or warm it up for dinner and serve it with some vanilla ice-cream. The best way to eat this cake is right out of the plate, with your bare hands, without sharing. Start with a slice… but you’ll end up eating a lot more. 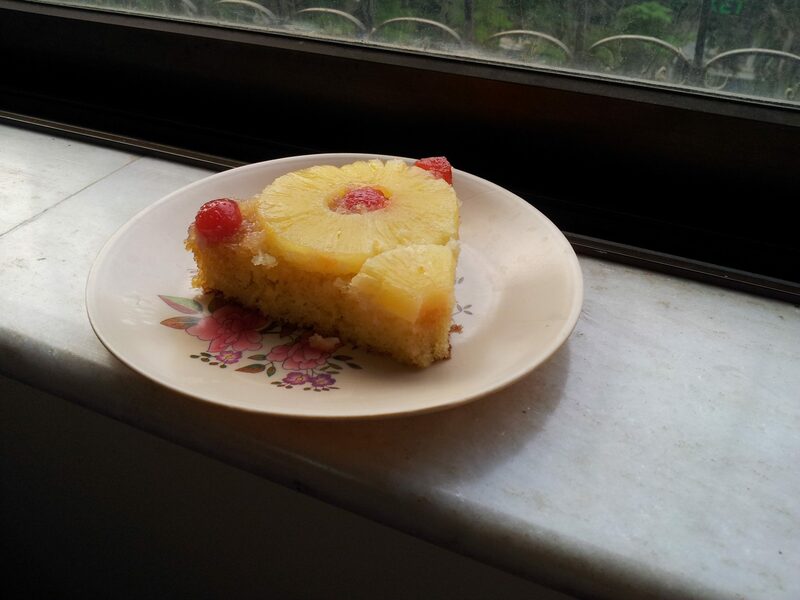 Yes, this was a loooonnnggg recipe but trust me, it will surprise you how easy it is to make the Pineapple Upside-down Cake. And so is most of the cooking this blog talks about. This is what I love the most about it! Akkta and Kanika let cooking remain the stress-buster and mood-soother that it is supposed to be and still manage to experiment. I love that they want their blog to be a practical inspiration to the cook in you rather than overwhelming you with over the top, highly complicated and unpronounceable recipes which you could only talk about but never actual try your hand at it. Kudos! I hope you enjoyed reading my post. I would love to hear from you should you have any suggestions or questions. Write to me on anubhandari86@gmail.com. Ta! Follow us on Instagram, Facebook and Twitter for regular updates on recipes and deliciousness!